Advertising Partner [CoinTracker]steemCreated with Sketch. 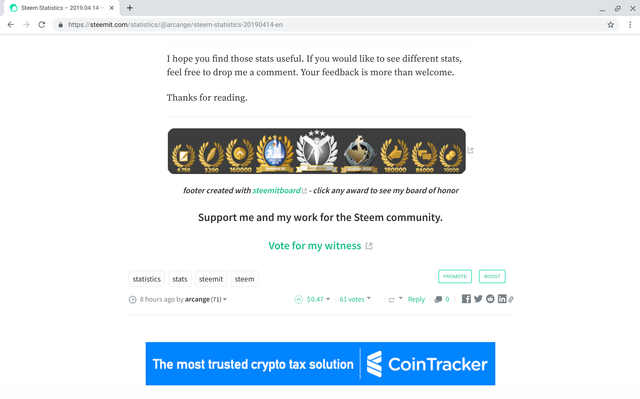 Please welcome CoinTracker now advertising on Steemit! Exactly. Unlike in banner advertising, owning an account and some Steem Power buys you influence and there is also a possibility of gaining from the appreciation of STEEM. yes, completely agree! -- On Steemit.com an advertiser is not just paying and competing to get some attention but becoming part of a community! Can you add the Steem profile? Coin Tracker is a legit business with a great product. Good to see them here. @birdinc : appreciate your hard work! Makes a great pairing and exactly what we want to see. Nicely done.